Today is my birthday. I made a cake to celebrate. It’s a very special cake you see. 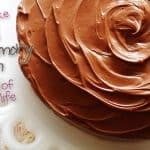 Not because of some secret ingredient or a particular filling, not because of a gourmet chocolate icing or pretty swirls. Today is not only my birthday, it’s my 45th birthday. That’s an important milestone for me as my own mother died when she was 45. I miss her so much. It’s almost 22 years and I still can’t think about her without sobbing. This is a special year for me making it to her age and still being here. Here with all 4 kids I bore that she never had the chance to meet. Here, cigarette free for the last 20 years because I vowed I wouldn’t let it kill me too. So I baked this cake for her, in her memory. To remind me of her, how special she was to me, and how I longed for her every time I had a parenting question or wanted to know about things I had done as a child. So if you’re willing to endure my blubbering through this blog post I’d be honored if you read along. If not, I completely understand, the recipe can be found at the end. First, let me make it clear that I lost my mother to heart disease, not cancer. But I still lost her. People lose loved ones all the time to illness and it doesn’t matter what took them away, the only thing that remains is that hole in your heart. It hurts my heart knowing that people are leaving this earth before their time. We came here from England in 1969, I was a mere tot at only 2 years of age. 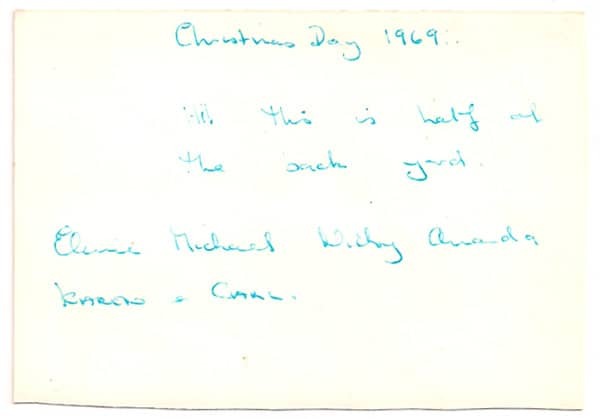 This photo was taken on Christmas Day in 1969. I’m the little girl in the white coat, my older brother is wearing the dark coat with the hood, and my mother is holding my younger brother. The other two children were our first friends in America. My father was back in England gathering our life together, so we took this picture to send to him and wish him a Merry Christmas. My mom was a beautiful person. Not only on the outside, but on the inside too. She was tiny, 5’4″, a full 5 inches shorter than me. I miss her smile and her glow, she was so full of love and happiness. When she was 39, she suffered a heart attack in a convenience store parking lot. I’ll never forget walking into the Intensive Care Unit and seeing her lying there, tubes everywhere. I was 17 then, a senior in high school. I was so scared, I couldn’t imagine life going on without her. It wasn’t until she was transferred to a recovery room that I found out she was also 5 months pregnant. A triple bypass was performed and the baby was fine. Baby “Johnathon” was a “surprise” that she and her boyfriend had not expected. With her illness she feared she wouldn’t be around very long, so she made the difficult decision to give him up for adoption. I looked into his big, blue saucer eyes through the nursery window one last time. I never saw him again. I only have a few snapshots of him to remember him by. As time went on there was a minor heart attack, and another, and an angioplasty to widen her blood vessels and prevent the blockage. Over the next few years I began working in the corporate world and didn’t have as much time for my mom. She would call and ask when we could get together and I would often have a reason why I couldn’t. We lived over an hour from each other and I worked full time. I didn’t see my mom as often as I should have and I wish I could do that all over again. It was my 21st birthday, so we got together to celebrate. 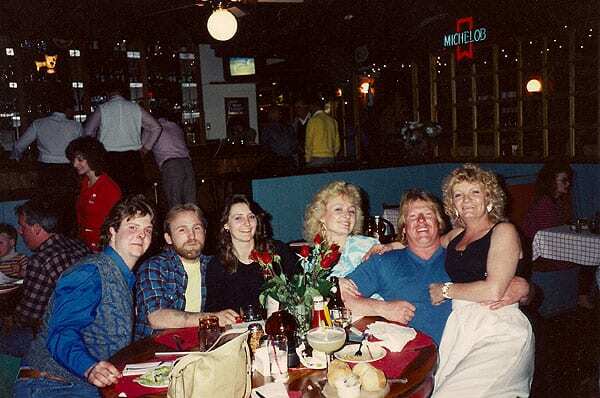 My brothers, my sister in law, my boyfriend (now husband) and my mom. We had a lot of fun and it was great to get together and celebrate! By now my mom was a grandma already as my older brother had a daughter from his first marriage in Germany while he was in the service. Unfortunately though that little girl, Jennifer, was across the ocean and my mom was unable to embrace her grandchild. It wasn’t long after that I became pregnant for the first time. I was elated and the first person I told was my mom. A few weeks later I miscarried and lost that baby. I was devastated but she was there to comfort me and assure me that there must have been a reason. A few months later I was pregnant again, so happy to soon be a parent. But alas, it wasn’t meant to be as I miscarried a second time. Again, my mother was there for me, to comfort me and tell me everything was going to be alright. September 7, 1990. It was a beautiful, clear day. Not a cloud in the sky. The sun was beaming, traffic was surprisingly light, and I made it home from work in record time. I stepped inside to a ringing telephone. It was my brother, telling me that mom was gone. I dropped to my knees and began to sob uncontrollably. I have never experienced such sorrow and heartache in my entire life. How could this be? I had just talked to her on the phone the day before, how could she be gone? She had experienced two major surgeries and 6 heart attacks in the last 6 years. She was invincible I thought. I truly believed in all my 23 year old naivety that she would never die. But she did. And she was gone. Stripped from my life. I would never hear her beautiful English accent again or see her lovely smile. Touch her soft face or hug her petite frame. That was it. It was over. Her life was over and she was no longer of this earth. She was 45 years old when she was welcomed into Heaven’s gates. September 8, 1990. Through puffy, tear drenched eyes I looked out the window as my husband drove us to her apartment. It was time to go through her possessions and meet with my brothers. Time to decide what to do with her things, who would take what. My mother didn’t have worldy possessions, she had a few trinkets, clothes I would never fit into, and your average apartment full of furniture. 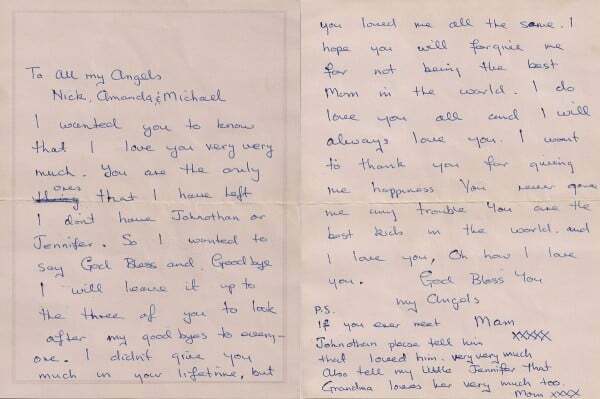 As I looked through her room, sobbing at everything I touched or turned up, I found a letter in her lingerie drawer. Through tears and a torturous ache I’d never felt in my heart before, I opened the envelope addressed to me and my two brothers. 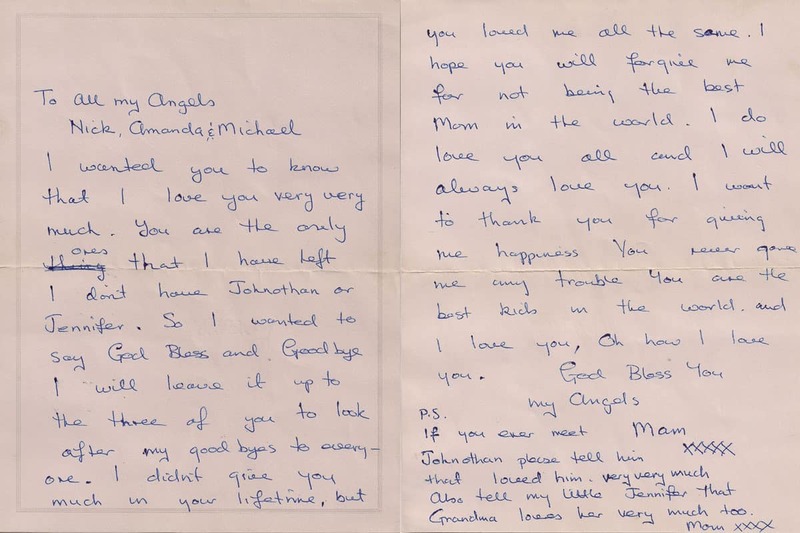 This letter tormented me for a very long time. It wasn’t until I’d been a mother myself for many years that I realized that it doesn’t matter how good of a mom you really are, you will always find fault in yourself. Oh mom, don’t you see? You WERE the best mom in the world. You loved me, you comforted me, you provided for me. Being a good mom is not measured by the material possessions you give to your children, it’s measured by the love and guidance that you provide. The knowledge that you instill in your children to help them become kind, responsible adults. One day, out of the clear blue sky you were torn from the pages of my life, just like that. I didn’t get to say goodbye. I couldn’t kiss you one last time or hug you ever again. There were no more chances. I missed out on that and ignored the warning signs. So naive. That day will be forever ingrained in my mind. I cried for a long time. I mourned and grieved and blamed myself for not seeing her more often. In my head I would hear the pleading in her voice over the phone asking when I would be coming to visit, I can still hear it all these years later. I was so angry with myself for selfishly choosing not to make the time. And then one day it was just too late. I missed the opportunity train and I’m not sure I’ll ever forgive myself for that. I’ve tried, but I still haven’t been able to. When I was a little girl, every birthday my mom would make me a yellow cake. It’s my favorite. 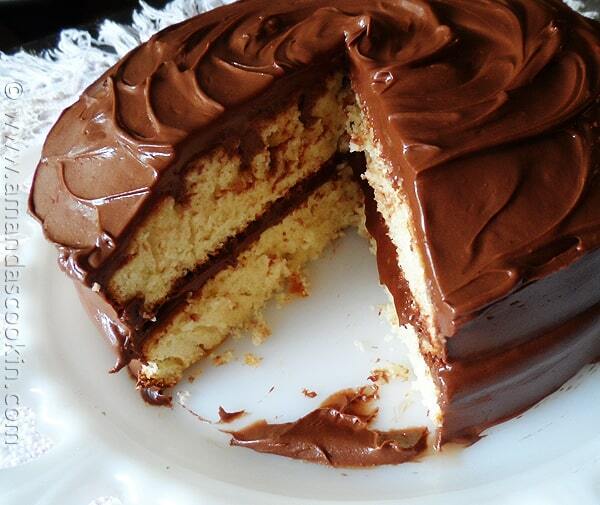 I’d rather have classic yellow cake with chocolate frosting over any other cake. Ever. She would frost it with chocolate, pipe on white stars and write a happy birthday message. I started looking for pictures I could share. I remember one in particular, my 6th birthday, because of the photograph that I’d seen that had captured that happy day in time. Sadly, I couldn’t find it. Even sadder, I discovered that I have very few pictures of my mom in my possession. So instead I’m sharing pictures of the cake I made for me and my mom. I baked this cake in honor of my life and of hers. I am celebrating today that while my kids have never met her, I have been able to keep her memory alive with stories and the few photos I have. I have been able to build a picture in my kids’ minds of their grandmother and how much she would have adored them had she be given the chance. I also hope to spread the message that it’s important to relish the time that we do have together and not to take that time for granted. Make time in your busy schedule to visit with your family before that opportunity is gone forever. Pencil them in if you must. Just make sure to do it. Don’t carry a guilt with you like I do. Death is an inevitable part of life. But heart disease, cancer and other fatal illnesses take too many people far too soon. 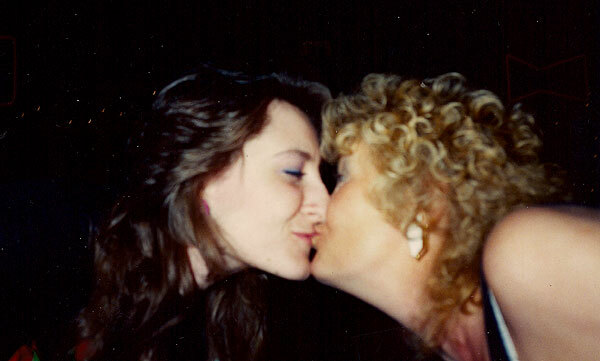 I loved my mother while she was here, and I will love her forever. Her passing has left a hole in my heart that can never be filled. I can only hope that I have honored her life, created a vision of her for my children, and become the woman that she hoped I would be. I love you mom. Rest in peace. I will see again someday. This yellow cake made from scratch is a wonderful replacement if you prefer not to use a box mix. Preheat oven to 350 F. Grease and flour 2 9-inch round cake pans. 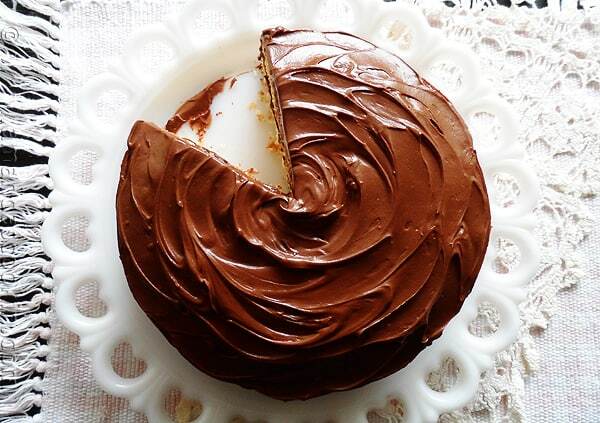 Combine all cake ingredients at once in your mixer’s bowl. Run mixer on low speed with paddle attachment until combined, about 30 seconds. Increase speed to medium and beat for 5 minutes. Scrape side of bowl halfway through. Allow the batter to rest in the bowl for a few minutes, then run a butter knife through the batter to remove any air bubbles. Pour batter into prepared cake pans and bake for 22-32 minutes, or until cake tester comes out clean and top springs back to your touch. Cool in pan on wire rack for 10 minutes then remove from pans and cool completely. Melt the chopped chocolate and butter in a good-sized bowl either in the microwave or suspended over a pan of simmering water. Cool. Place powdered sugar into the food processor and blitz to remove lumps. 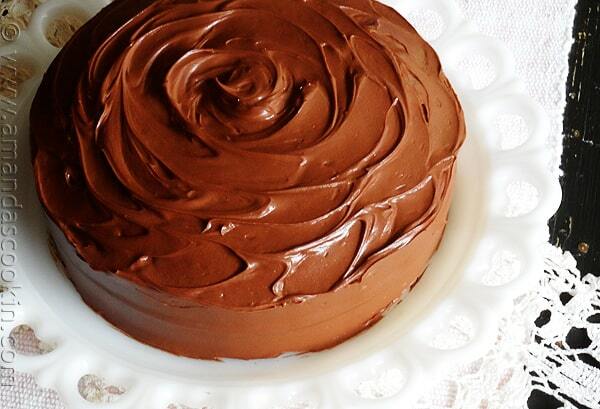 Add remaining frosting ingredients and process until smooth. Spoon about 1/3 of the frosting onto the center of the cake-half and spread with a knife or spatula until you cover the top of it evenly, leaving about 1/2? from the edges. Sit the other cake on top, normal way up, pressing gently to sandwich the 2 together. Spoon another 1/3 of the frosting onto the top of the cake. 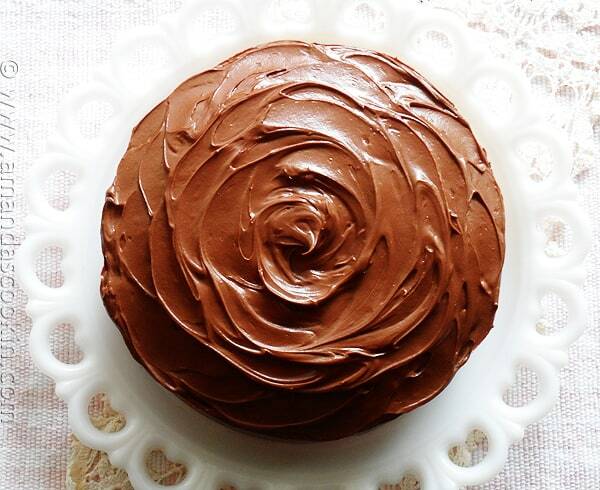 Spread the sides of the cake smooth then spread the frosting on top in a swirly, textured way. Hint: For my swirled top, I hold the icing spatula over the top outside edge and turn the plate as I go, working my way into the center. both my parents until they both passed. My Mom left 20 years ago and my day 16. Both died of cancer. Please believe me when I say each and every one of us left behind, have a, or some regrets about our parents. Things said or not said, done or not done. This is part of the human condition and the fact that we never know when a loved one will pass. I do know I tried very hard to give my best and I would nurse them all over again, just to be able to spend one more day in their company. You see I was their adopted child and they were the most wonderful, loving, giving people I have ever known. I miss them every day and like you, I have tried to paint a picture of them for my grandchildren, so that they can too carry a memory of my wonderful parents. I am very sure that your brother was adopted into a wonderful home as well. Never be too sad Amanda, just carry on celebrating he,r for all the good times you shared. One other thing, you never stop longing for them when you think of them. Thank you for sharing your story Angela! Your parents sounded like truly amazing people! They were very lucky to have such a wonderful daughter to take care of them :) Thank you for your kind words too! <3 It means a lot! I came here looking for a traditional British trifle recipe, stumbled upon this post. We are the same age, with British mothers, both of us have four children, neither of our mothers have met their grandchildren. But there the similarities stop because my mother is very much still here, but disinterested in me, my life or my children. She never has been. Threw me out when I was 18… never looked back for me, always had better things to do. It’s difficult. We both lost our mothers, only yours was a good mother, which seems unfair. I’m so sorry Lilibet :( I wish I knew the right thing to say, but I don’t. I can only hope that your children bring you the joy that you deserve and sometimes we just have to let go of the people that don’t. I hope you have a Merry Christmas. Hi Gia. 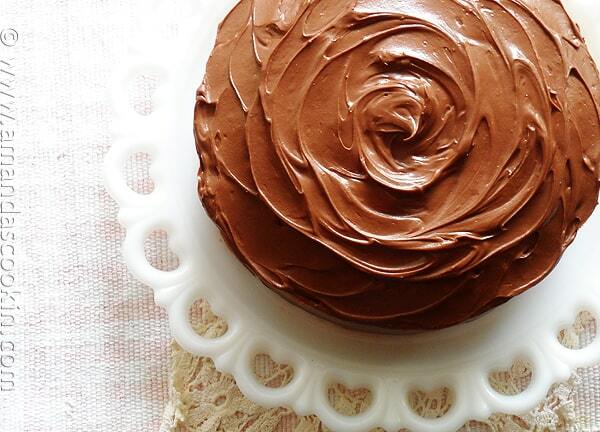 This cake is an adaptation of one I found in an old cookbook. Those were the mixing instructions given, so that’s what I have always done with this cake. Because the beating time is considerably longer than most cake recipes where the butter and sugar are creamed first, the long beating time aerates the batter. Hi Amanda, Thank you for sharing this loving tribute to your mother. 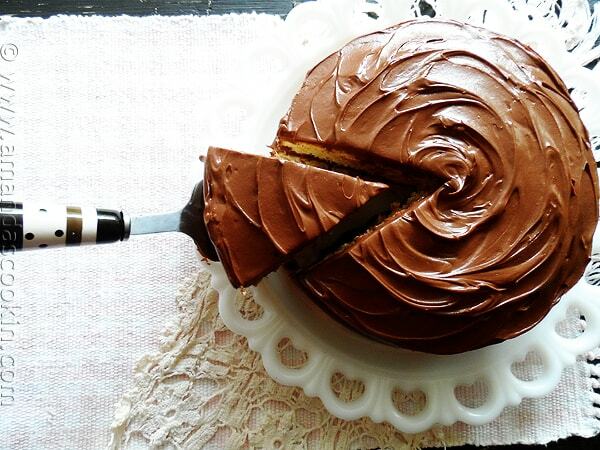 This is my favorite favor cake combo (of all time) also and I look forward to trying your recipe soon! 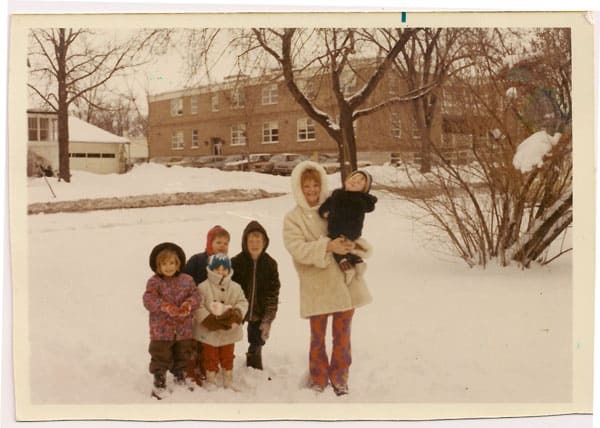 I love the pictures of your family in the snow in 1969. We have similar childhood photos (slides) from around the same time, as I think we’re about the same age. I *love* your Mom’s pants! What a special time!! I pray that you are able to forgive yourself and release the guilt into God’s loving hands. You are forgiven and loved. I’m sure your wonderful Mom forgave you a long time ago. Peace and blessings to you. Thanks for your wonderful blog! Not certain on how I stumbled across your recipe link or why I even clicked on it, as it’s not like I don’t already have 10 recipes in the Que awaiting my new Kitchen Aid Mixer. I was not even looking at recipes but a high chair for the granddaughter. I thought well, the perfect Yellow cake is always allusive even in the best of cookbooks so I decided to have a little look at yours. I will admit I seldom read through the blogs & yes, I will admit, skip to the recipe. I’m 62 & lived an adventurous life with so not much left to learn. Then there was you & your Mother. 15 minutes ago I was crying not getting any air and when I recovered I want to let you know that your short post has helped through what has been the most difficult week, Month, years of my life. I lost my son Jonathan, Sept 3, 2014 at the age of 45 and have not accepted that yet. Each day is like he’s just away and will come through that door any minute as he always has. I can see that huge smile as he comes blazing through the front door with, Hey, Mom, you here, come have a look, you’ll not believe what I did!! Any & everywhere he went, he lit up the room like a bright light turned on. There were no strangers to him and anyone there that didn’t know him, felt he was their best friend when they left. I stumbled upon a recent photo of him “accidentally” a few days ago which shoved me in direct line of fire with reality. I lost it and having a hard recovery on this bout. I have not found a way to accept it and still avoid current pictures – having all his younger ones up instead. I would imagine is similar to you reading your mothers wishes each time. I read your most wonderful tribute to your Mother and lost it again, but in a good way. You have help me see the light that I must go into. It is so beautiful how you speak of your mother and her life and how she affected you and your life and family. I got a real sense of who she was, a very brave women. She was also a wise women and I would guess, she knew what was possible. Wiser than me. Anyway I will bake the cake in honor of your Mother. Bloody hell, I love the British!! I have British in me too. Thank you for opening the door and allowing me “to see”, where I can go to. I need to honor his life as wonderful as it was and to make certain he is not forgotten. I know I had 45 wonderful years with him and would do it all again even if I knew the outcome. On an upper note I do have his Identical twin brother with wife & grandchildren who live here with me and do keep me hopping. Thank you again and I thank your Mother for having you, to get me to this point. I already know the cake will be the best of the best but I will post and assure you it is. My dear Amanda, my heart crys for you dear friend. I promise you i know what this has been like for you . I lost my Mother also at 45 , i thought i would never make it to 45 as well and so did my younger sister, this was in 1967, i had gotten married in Sept of 1963 and mother died 10 days after my 24th birthday in March, she would have been 46 in May. Like you, she never got to know her grandchildren and we thought i may have been pregnant with her first grandchild, but found out later this was not so, but she left us thinking she was, so that in itself was a beautiful thing. I only had two children but my sister had five. There were four of us, our brother being the baby, he had just come home from serving in Vietnam, such a tragic thing for all of us, but mostly for him. Amanda, what a lovely tribute to your mom. Let go of the guilt you are carrying. Just the same as your mom apologized for not being the best mom, and you thought she was wonderful! She too thought you were a wonderful daughter. As a mom, you yourself should know she would never think anything but the best of you! Amanda: As a former caterer, a Mom, a Grandmother, this cake rocks but your tribute to your Mother is awesome. I’m positive that your Mom felt your love and it’s beautiful that you are able to express your feelings. Moms have a way of knowing that their children care and love, even when they don’t express it. 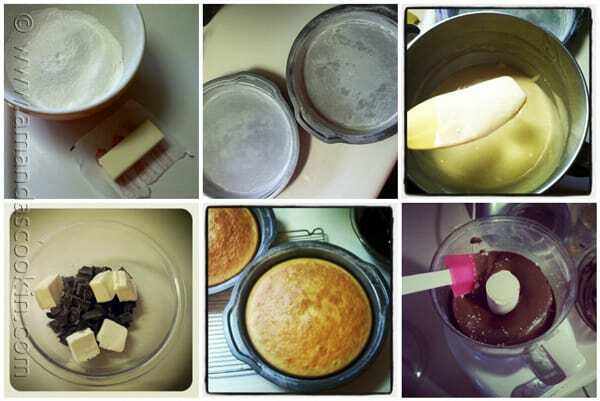 Now to the good stuff…I have made many many cakes from scratch but this surpasses ALL of them. The lightness,texture and flavor was excellent. 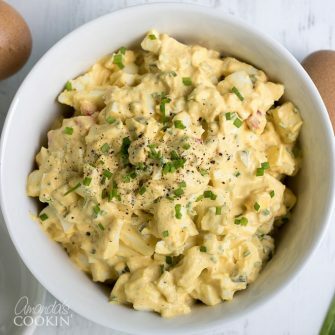 The color was a nice yellow as I used my farm fresh eggs. Oh, and the high rise of the cake was beautiful for the amount of batter in a 9 inch pan. 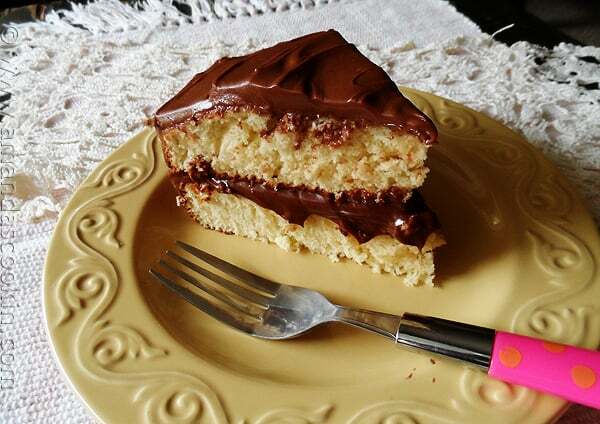 I will be making this again soon, but as 2 Boston Cream pies. I really enjoyed reading your blog. Thanks for sharing your story and as parents we do our best with our children. No good mother should not feel as though they were not a good mother. 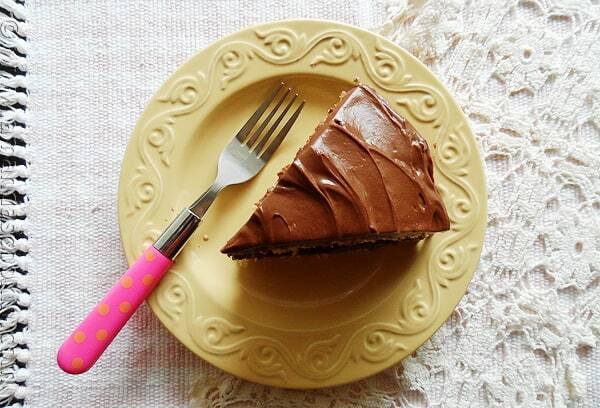 I love yellow cake with chocolate frosting too. I loved the meaning behind your recipe. I will be sharing it with my family. Blessing to you and your family. Thanks so much for your kind word Dennea!